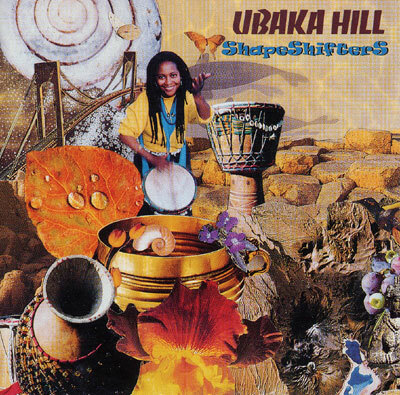 Ubaka Hill (Ooo-bah'-kah) is a nationally-known drummer, teacher, performer and visual artist. She began drumming professionally with a local jazz group in 1974 at the age of 18 while growing up in inner city New Jersey. Since then Ubaka has performed with various creative artists and has co-founded percussion performance groups. ""My teachers are many,"" she says, though her earliest inspiration as a female percussionist came from Edwina Lee Tyler. Ubaka has recorded with various other artists and on soundtracks for educational and creative videos. Ubaka is a shape shifter, a storyteller, an innovative drummer in the creative tradition of jazz and in the spirit of social change. Her first drum was the conga; the djembe is now her primary instrument, her ""other voice."" She also plays other kinds of drums and percussion instruments from various cultures. The root of Ubaka's drumsong is primarily intuitive, inspired by the rhythmic drumming traditions of North and West Africa, Latin America, the Caribbean, American Jazz and Shamanism interwoven with poetry and song. She has become an inspiration to many who wish to learn to make and play drums and to share the power of drumsongs as a tool of liberation, community building, healing and personal joy. As a teacher, Ubaka has the unique ability to make drumming easily accessible to all who want to feel their own voices through the voices of drums. She has begun to teach drumming to the deaf and hard of hearing. Ubaka has performed and taught numerous workshops on the art and spirit of drumming throughout North and South America. With great energy, talent and sensitivity, she brings drums, percussion, poetry, and song to hospitals, conferences, music festivals, universities, rallies, children's programs, community centers, and to various celebrations and ceremonies. Ubaka's personal mission and vision is to be a catalyst; to inspire and develop, to document and preserve the evolving tradition of women and drums, from the sacred to the secular, fostering a tradition in the making. She is the founder and director of the Drumming Institute - based in Brooklyn, New York - which provides workshops, performances for all ages, and related information and resources to the drumming community. She is the editor and publisher of the newsletter, Drumsong/Drumming Womyn's News: Views and Attitudes. The Drumsong Institute is currently facilitating a national survey on women drummers of all levels and ages in preparation for written documentation on the evolving tradition of women and drums in the U.S."
Ubaka is a fiery, passionate, and radiant drummer/ chanter/ singer whose performance builds bridges and transcends boundaries while elevating the spirits of all who hear -- her music is intensely woman-identified, life-loving, transformative, spiritual, and revolutionary, blending song, poetry, and rhythm into a heady brew.